Right-wing bloc projected to be stable at 42 seats - but Jewish Home falls from perennial third-place spot. 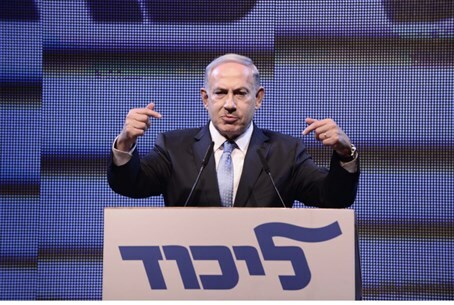 Likud has emerged ahead, the latest elections poll revealed Saturday night - but at the expense of Jewish Home. Likud topped the poll, published for TNS for Channel 1, at 27 seats; Labor was a distant second with 23 seats. The Arab parties took third place at 12 seats, followed by Jewish Home and Yair Lapid's Yesh Atid, both with 11. The haredi United Torah Judaism (UTJ) has overtaken Moshe Kahlon's Kulanu party, at 8 and 7 seats, respectively. Yisrael Beytenu and Shas are tied at six seats each. Bottoming out the poll are Meretz, at 5 seats, and Eli Yishai's Yachad-Ha'am Itanu party, at four seats and just past the threshold. Overall, the right-wing still remains close to the 41-43 seat marker for a coalition; according to this survey, a combination of the three parties most likely to form a right-wing government - Likud, Jewish Home, and Yishai - adds to 42 seats. 61 are needed to form a coalition.